Today we’re proud to release Krita 3.1.3. A ton of bug fixes, and some nice new features as well! Dmitry and Boud have taken a month off from implementing Kickstarter features to make Krita 3.1.3 as good and solid as we could make it. Thanks to all the people who have tested the alpha, the beta and the release candidate! Thanks to all the people who have worked on translations, too, and to Alexey Samoilov for picking up the maintenance of the Ubuntu Lime PPA. We also have a new version of the Windows explorer integration plugin, that makes it possible to show thumbnails of .kra and .ora files: several memory leaks were fixed, and a conflict with .ora files created by an Oracle database too was resolved. Thanks to Alvin Wong! The full list of changes with 50+ bug fixes can be found in the full release notes. A snap image for the Ubuntu App Store is also available from the Ubuntu application store. 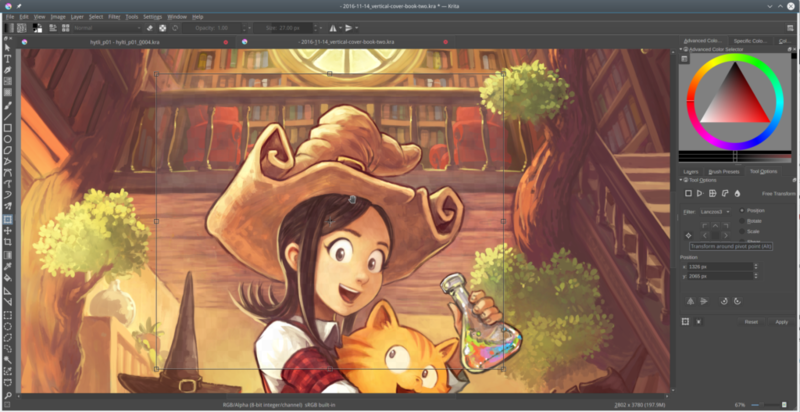 You can also use the Krita Lime PPA to install Krita 3.1.3 on Ubuntu and derivatives.